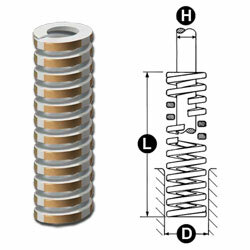 Lamina DieMax™ L Die springs are mechanical springs designed to produce the maximum amount of force with minimal volume. This is the Heavy Duty series that provides greater force than the red Lamina springs and has shorter travel to solid. The gold (yellow) color code and 97 standard sizes are similar to the Raymond Gold Die Springs. But the coils are formed into an optimal rectangular wire design and made of spring-quality Chromium Silicon alloy, high-tensile strength steel in accordance with ASTMA A1000-99 specifications. DieMax L springs are manufactured in an ISO9001-2008 facility.